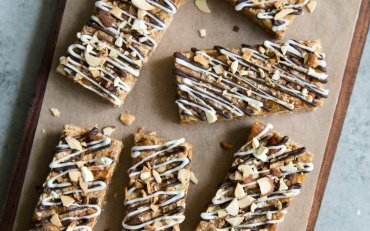 This tasty granola bar recipe was shared with some members of our team at the Dieitians of Canada conference by the Almond Board of California. Line an 8-inch square baking pan with parchment paper, foil, or wax paper, making sure to cover the sides of the pan. In a large bowl, add rolled oats, almonds, apricots, almond butter and honey. Toss together until mixture is thoroughly coated. Transfer granola mixture into prepared baking pan. Using the flat bottom of a drinking glass or measuring cup, firmly press the mixture into the pan to ensure mixture is evenly distributed. Cover and freeze granola for 15 minutes until firm. Lift granola out of pan and cut into 12 bars. Garnish with melted dark and white chocolate, as desired. Store granola bars in an airtight container in the fridge for snacking throughout the week.